NUM offers a wide range of products for the automation of CNC machines. The modern, scalable, and high-quality hardware ensures high availability and long-lasting investment. NUM CNC systems traditionally have an open and powerful software that adapts to the respective needs of the machines to be automated. The adaptability is not limited to the PLC programs or HMI adjustments. Specific functions can, for example, also be integrated to the real-time system of the CNC control. But it is never the case that the system is only a building block. The system represents a complete and ready CNC, which can be modified at will. The CNC control itself is a key element of the NUM solution. Powerful processors with high computing speed and an intelligent layout with potential for expansions ensure a high preservation of value. The PLC is programmed according to IEC 61131-3 and the modern development environment provides new tools for development, commissioning and servicing. With a capability of more than 200 axes, over 40 channels, 4000 IOs, more than 1 GB of PLC memory and more than 30 MB of user memory, Flexium+ can easily control the most demanding applications. Thanks to the full scalability, small configurations can of course also be optimally represented. 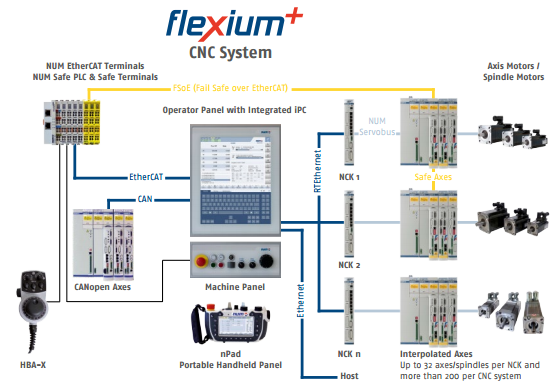 For projects in need of a High-End CNC Solution we use NUM Flexium+ 8 and Flexium+ 68 CNC Platforms. The Flexium CNC System gives us tremendous flexibility when it comes to developing comprehensive solutions for our customers. Additional options can be selected individually or as a technology package (milling, turning, woodworking, etc.). Having this kind of flexibility allows us to provide our customers with solutions in a timely and cost effective manner. NUM CNC systems are known for their high degree of flexibility and adaptability to various configurations. This is achieved primarily through powerful functions and operator panels with dedicated Human Machine Interfaces (Flexium+ HMI). Flexium+ systems have high-level CNC functions and high performance servo drive algorithms that can be further tailored thanks to the well known dynamic operators (ISO or C) for the CNC and their new counterpart on Drive: The Drive embedded macros. This allows for the productivity of all types of machines to be maximized. NUM produces a comprehensive range of motors, all offering excellent volume/performance ratios and great dynamics, to suit almost any application. In combination with NUM drives, these motors provide excellent smoothness even at very low rotational speeds, and can be easily integrated into machines. As an integrator we have completed hundreds of retrofits in the United States, Mexico, and Canada. We are extremely proud of the fact that we don't just offer machine tool retrofits - we offer turnkey solutions that leave our customers with little to do when it comes to retrofitting their machines. All of our CNC retrofit solutions include factory warranty on all hardware - including CNC, drives, and motors. We also offer 24/7 support for the life of the control system, so you can be sure that you'll have the support you need to keep your machine up and running. We would love to work with you on your next retrofit project. To receive a free quote for a turnkey NUM CNC retrofit solution, please click the red "Request Quote" button above and provide your contact information and a brief overview of your retrofit application. Once we receive your RFQ one of our Controls Engineers will contact you to discuss your application in more detail. We look forward to working with you! 3-Axes Siemens 808D Mill CNC Kit, Siemens Motors & Drives, Pendant Config. 2-Axes Lathe CNC Retrofit Kit, Siemens 808D, Console Config.